If any fans have these Combat! items, we'd love to get more information about them and better descriptions. These World War II toys based on the TV show are hard to find today. Please email us and brag about your collection. Prices cited below are from a 1995 issue of "Toy Collector and Price Guide" magazine. Thank you to Jean (aka "Squad") for sharing with us information from this publication. The above WWII toy playset was auctioned on eBay in 2000. Atomic Candy (the seller) described the set as follows: "This is a very rare piece of television memorabilia. This is a childs playset so that you could be Sarge or the Lieutenent. Comes with holster and strap with great graphics of Sarge and Lt. Also comes with generic plastic and steel tommygun, die-cast revolver, capbomb, and knife. Everything is dead mint unused. Comes in original shipping box.!" 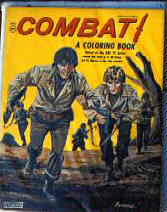 Combat! card game from Milton Bradley. Value in excellent condition $45. Three may have been issued during the run of the show. I've personally only seen the one pictures below. Oil Paint by Number Set (Hasbro, 1963): includes a 15 by 17 inch carry case box with three 12 by 16 inch pre-numbered sketched canvases, 28 vials of paint, and 3 brushes. Value in good condition $100, in excellent condition $115, in mint condition $125. At the end of the 1990s, already painted paint-by-number art became quite collectible - so if you painted your and you still have it, it's got value.  Military paint-by-numbers already painted have become especially popular post 9-11. 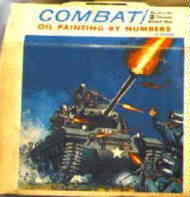 Oil Paint by Number Set (Hasbro, 1963): includes a 14 by 20 inch box with three 12 by 14 inch pre-numbered sketched canvases, 14 vials of paint, and a brush. Value in good condition $75, in excellent condition $90, in mint condition $100. 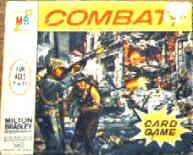 Milton Bradley issued two 125-piece jigsaw puzzles of "Combat!" Value in excellent condition $25. The "Official Playset" by Superior Toys consists of tanks, trucks, artillery, and toy soldiers. Value in excellent condition $200. Combat! Battle Gear Playset, includes a machine gun, pistol, grenade, helmet and knife of plastic. Value in excellent condition $150.